Biomedical engineers at the University of California, Davis, have created a lab-grown tissue with similar properties to natural cartilage by giving it a bit of a stretch. The tissue, grown under tension but without a supporting scaffold, shows similar mechanical and biochemical properties to natural cartilage. The bioengineers report their results in a paper in Nature Materials. Articular cartilage provides a smooth surface for our joints to move, but it can be damaged by trauma, disease or overuse. Once damaged, it does not regrow and is difficult to replace. Artificial cartilage that could be implanted into damaged joints would have great potential for helping people regain their mobility. Natural cartilage is formed by cells called chondrocytes that stick together and produce a matrix of proteins and other molecules that solidifies into cartilage. Bioengineers have tried to create cartilage and other materials in the lab by growing cells on artificial scaffolds. More recently, they have turned to ‘scaffold-free’ systems that better represent natural conditions. The UC Davis team, led by Kyriacos Athanasiou in the Department of Biomedical Engineering, grew human chondrocytes in a scaffold-free system, allowing the cells to self-assemble and stick together inside a specially-designed device. Once the cells had assembled, Athanasiou and his team put them under tension, by applying mild stretching, over several days. "As they were stretched, they became stiffer," said Jerry Hu, a research engineer and co-author on the study. "We think of cartilage as being strong in compression, but putting it under tension has dramatic effects." The bioengineers achieved similar results with bovine cells as well. The new material had a similar composition and mechanical properties to natural cartilage. It contains a mix of glycoproteins and collagen, with crosslinks between collagen strands conferring strength on the material. "In this comprehensive study, we showed that we can finally engineer tissue that has the tensile and compressive characteristics of native tissue," Athanasiou said. "The artificial cartilage that we engineer is fully biological with a structure akin to real cartilage. Most importantly, we believe that we have solved the complex problem of making tissues in the laboratory that are strong and stiff enough to take the extremely high loads encountered in joints such as the knee and hip." This story is adapted from material from the University of California, Davis, with editorial changes made by Materials Today. The views expressed in this article do not necessarily represent those of Elsevier. Link to original source. Lab-grown cartilage grown with tension (top) shows similar mechanical and chemical properties to natural cartilage. 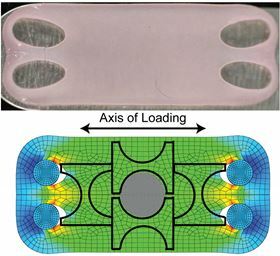 The lower image shows computer modeling of strain distribution across the artificial tissue. Images: Athanasiou lab, UC Davis.